Immediate in - room check in upon arrival and accommodations designed by Phillippe Starck. Branded beach bag outfitted with all of your bathing needs including Hampton Sun Care for smart, serious sunbathing. A personalized, in - room bar by Proximo based on preferences. 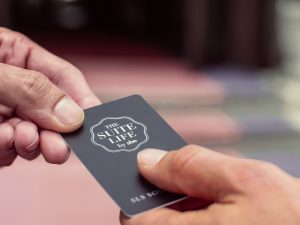 Preferred access to sbe restaurants, nightlife, events and perks with preferred partners. A dedicated phone line gives around-the-clock access to assistance, recommendations, priority reservations and VIP access. Priority access to Lincoln house car. A welcome bottle of Perrier-Jouet champagne. Poolside Peroni and Whispering Angel along with two complimentary reserved loungers and preferred cabana selections. Unlimited Evian water and in-room Lavazza coffee. Personalized services and amenities available 24/7 with a 24-Hour Experience Connoisseur. A luxury yacht cruise with VanDutch. E-mail reservations.southbeach@sbe.com or call 305-455-6308 to book now. A 360-Degree lifestyle experience. Discover all the Suite Life has to offer.